Genaker Cloud PTT is an online instant communication service between groups of professionals using mobiles or Smartphones. 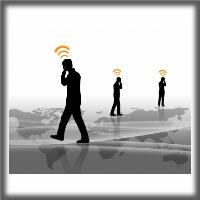 This service emulates “Walkie-Talkie” style of communication with no delays / limitations over group sizes or coverage. Using the service is very simple, one can speak directly to the rest of the group members by the touch of a button. This kind of communication helps to maximize productivity and coordination of teams. Supported on mobile phones and Smartphones. Rapid call establishment and minimal delays. Groups of up to 200 participants. Location and tracking via GPS, WIFI, Cell-Id. Centralised management of user’s configurations. Control centre with location and recording functionality. Remote installation procedure via SMS. Genaker Cloud PTT allows a company to use one or more installed Office Terminals (base team) on a single computer. The Office Terminal allows users to record conversations, locate members and contact any one of them, make individual calls, communicate with previously defined groups and even create instant groups, all whilst participating in simultaneous sessions. Available on Android, Symbian, Windows Mobile and PC Windows. Solution based on cloud servers, allowing high availability and scalability of the service. Based on IP communication using the data connections of the mobile terminals (over 2G, 3G, LTE or WIFI bearers), for which mobile data flat-rates are recommended. Point to point solution based on mobile industry standards making it an open and interoperable solution. To access the service from a desk terminal, a Windows multimedia PC running XP, Vista or Wndows 7 operating systems and an Internet connection is required. PIPoC is a unique and economic solution that allows interconnection of mobile phone and PMR networks (4 wire analog, TETRA…). Independent from the device, operator or location, the users can take the advantage of cellular services and radio communication on their own Smartphone at no additional cost. PIPoC offers flexibility, efficiency and low-cost to an organisation and provides a higher level of security to the user.